This fierce captain is a rather frightening Psyder. He's the sort of Psyder that your friends says looks funny but is probably harmless- and then BAM! They're dead. He is horrible aggressive with a devil may care attitude. He will plunder and pillage and take whatever the hell he damn well pleases. Nothing is out of reach from his wrath, and no person or shiny can keep you safe. If he wants you, he will come for you, and leave in his wake a trail of destruction and devastation. He is a corrupter and easily swayed, not being too bright as a Psyder, luckily for everyone else. If you've heard about something wonderful to raid, then maybe he might just stop and let you live until you've proven your worth. Or not. He's cruel and mean-hearted and will get a kick out of making your cry. Although fire really isn't going to kill him, he's been burned terribly in the past and has a tremendously irrational fear of it. Unfortunately for him, the barbed trident that he keeps with him can't be picked up by his flimsy legs. So he tends to wave it around in a carefully rigged system of webbing. Don't go underneath it- and if you are, find a way out, quick! It could drop at any time, and you get the feeling that he won't be very apologetic. He's a Psyder so it's not too huge- but it hurts to be impaled by a fork over and over again. This Brown Recluse is probably the most horrendous, disgustingly ugly Psyder you will ever meet. He's really fat and heavy, with limbs a little too twisted and little boils and other unsightly disfigurations and scars popping up all over his body. Yuck! His fur beady little eyes are quite potent and utterly suited to him. He can slowly destroy you with Destruction, learn all your secrets with X-Ray vision, paralyze you with fear (hypnotism), and spy on you with his Telescope. An elaborate male, this recluse has various shades of brown all over his body. His abdomen, nearly the same size as his head, is a light brown with curious almost leopard-like spots. His head is significantly darker, with two near black stripes running down, and each of his legs are a dark gray-black that fade into an almost glassy light gray. He's a big guy, definitely, but his strange patterned appearance is almost bewitching. Despite being known for their aggressive nature, this Brown Recluse is, by Brown Recluse standards anyway, rather soft and easy going. He's a little soldier to his bonded, that's for sure, and his mind is easily swayed and changed. He's sort of, would you call it, kind for a high up Lord, and acts mostly based on his bonded and others around him rather than for himself. He will jump and snap at you if the time calls for it, but otherwise, he lets a surprising amount of things slide for an aggressive shiny. He's the kind of lord that may rule with an iron fist, but will only crack down on things that really need the attention. Otherwise, you might find yourself getting away with more things than most other Brown Recluse would allow you to get away with. He's also amazing with thread, and you'll find that his webs are almost artistic, and look quite unlike any other web that you might see. This lady seems almost drained of color. A majority of her body takes on what looks like a silver that lacks a metallic sheen, with flecks of a dirty brown dotted all along her body rather than consistent brown bands. Her joints are darker in color, and her legs are all dipped in that same dirty brown, with a band of darker brown just over it. Thin stripes run down her abdomen, and if you didn't know better, you'd almost say that her single eye gleams blue under the certain kind of light. As a female Funnel Weaver, this lovely lady is quite grounded in her gender. She seems to be flirtatious with other Psyders, romantic in a Psyder-y sort of way. Despite this gushy track that she has, she's normally rather logical and systematic, she's a smart one this Psyder is, and she's got that smooth feminine charm that gets her out of sticky situations. As a reader of emotions, she's got a power that's marvelous and at the same time dangerous, her ability to use her single eye is enhanced with her rank, and she can use it to her advantage easily. Never fear however, as she doesn't usually like to start up trouble unless trouble comes knocking on her web. She's rather relaxed and peaceful, willing to socialize with other humanoids and shinies alike. Her mind flips rather easily though, as she's quite fickle, even with her logical mind set, so she could turn on you subtly and easily to the point where you don't even notice that she's gone from friend to enemy. Used as the control, there is absolutely nothing wrong with this Psyder. He is as normal as they come and rather confused about why all the other ones are behaving like lunatics. Drugs and alcohol? None for him! Sure, he might have sampled it when it passed through a fly or mosquito, but the effects were minimal on his own body. The laboratory workers never did anything to him, so he shows no signs of fear or anything like that just the idle curiosity of your typical Psyder. He’s an amazing web-builder and all around good guy that does his job and comes home from work every day with a tired smile on his mandibles. 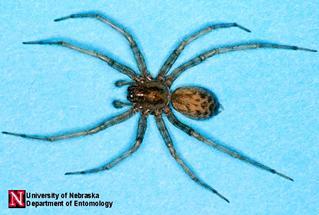 He is rather fetching for a Psyder, with a cephalothoarx that is only a touch smaller than his ovular abdomen. All eight of his legs are long and in working condition, giving him some height but nothing as crazy as a Daddy Long-Legs. He’s a nice blend of grey and tan, a lighter tan broken by lines of dark grey that run from each side of his eye and condense in a spot on his thorax. The spot breaks down into three thick lines that run over his abdomen, while his underside is a pale and flawless khaki. Each leg is this color, but laid over it are leopard like spots made more difficult to see by the heavy hairs that coat each delicate limb. Everyone, including himself, makes mistakes from time to time. As such, he’s developed excellent mastery over the power of Destruction, able to correct and make repairs in his web. What, you thought he’d use his powers for evil? Hello, he’s not the Crack Cocaine Psyder! Shasutan is almost always just a little bit confused, mostly by what she's looking at or where she is. When you have telescopic and microscopic vision getting around can be a little bit difficult, and often she needs a little bit of help, but she is generally very intelligent and once she's familiar with an area getting around gets a whole lot easier for her, eventually to the point where you wouldn't even think she had trouble. She still enjoys a little bit of company though and is more than eager to put her vision to use and share what she's seeing with you. Her vision is keen and her memory keener, picking up on all kinds of details at any distance it only takes a few seconds for her to memorize every detail of an object. And she will examine everything, developing a comprehensive knowledge of her surroundings and anything presented to her. Classifying, categorizing, and organizing anything she is given to keep everything neat and orderly. You could almost consider her OCD. She is friendly and social enough so long as she isn't being interrupted and gets on fairly well with anyone that comes to find her, though she's not particularly known for going out and seeking anyone's company. Leaning on the large size for her rank she is strong and determined, with a careful dexterity for manipulating objects larger than her there's not a whole lot that can stop her when she sets her mind to it. Her impenetrable thick exoskeleton is more of a steel grey than a pitch black, and the cream spines along her body are short and stubby, far from anything impressive. She's very simple and this is quite alright with her, not drawing a whole lot of attention to herself makes it generally easier to go about her work undisturbed. Unlike his brother Long-Legs, this fellow is pretty simple in appearance. His body is a single shade of brown mottled with a darker umber, and while his legs are equally simple they are at least still fairly unusual. The front four are all a solid burnt sienna, and the back four are all plain brown without any of the same mottling. While by no means skilled at handling thread, he's about as good as any of your average Daddy Long-Legs are. He happens to be gifted with an eye for sensing the auras of emotions, and he is exceptionally good at picking out the dominant color in the confusing swirl, including noticing when it changes subtly. Sibling rivalry, at its finest. He is convinced there's nothing he can't do, especially if it means doing it better than somebody else. In a way, he's sort of an optimist, although more accurate description is probably blindly arrogant. It just doesn't even occur to him that there could be something out there that's impossible for him to do. He enjoys the thrill of the challenge, as well as showing off, and of course, being admired for his great showing off. After all, those super resilient Psyder bodies are good for pulling off stunts a lot of other shinies can, like dancing through fire, or surviving being crushed by 50 times his own weight; he may as well put to use! His emotional sightseeing is good for figuring out who he should try to pull into a challenge himself, and who to show off in front of, and how to show off in front of them – do they need something that would cheer them up, or perhaps something to help them use up a lot of extra energy? It's a fairly cunning ploy, for a common Psyder.